FireFights!#1 (FF1), designed by Steven Swann, Burnie Hegdahl, and Bruce Rinehart, is an innovative idea that unfortunately just didn’t work well in practice. 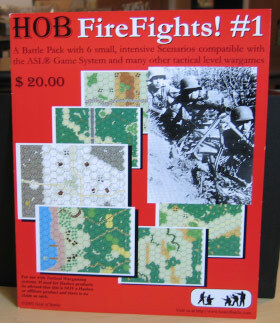 The basic concept behind the FireFights! series of scenarios (which includes two packs and one scenario released on the Internet) is to use small, non-geomorphic maps (the size of half a geomorphic map) in conjunction with equally small scenarios to create a unique, fast-playing ASL experience. The scenarios take place in Poland 1939, Finland 1939, Russia 1941 (2 scenarios), Sicily 1943, and the Solomon Islands in 1944. The creation of the small historical maps is certainly the best aspect of the FireFights! concept; they allow a wide range of terrain representations in a single module. Furthermore, they allow the creation of very specialized terrain features that either wouldn’t really work in a geomorphic map format or would be too specialized to create an entire geomorphic mapboard around. After the first FireFights! 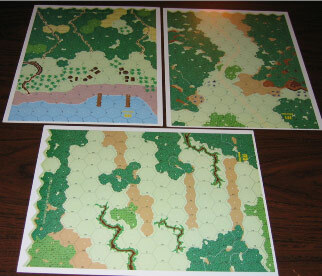 scenario was released as a teaser on the Internet, one player suggested making the boards into half-map overlays so that other designers could use them in conjunction with geomorphic boards. Late in the creation process, Heat of Battle could only make some concessions in this regard; however, FireFights! #2’s maps are fully usable as overlays, thus making them more useful to scenario designers (in theory, anyway; in practice, no designers have bothered to make use of this resource). The six maps in FF1 (printed on three sheets of glossy cardstock paper) show a variety of situations. 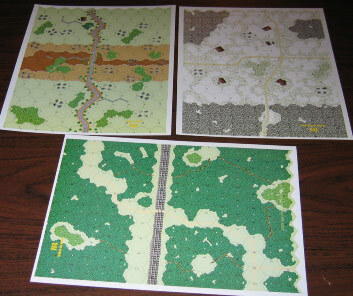 Three of the maps feature unpopulated, largely wooded areas (one bisected by a railroad); these would be very useful for partisans or PTO scenarios. A fourth map features a snow-covered clearing; what is innovative about this map is that the map itself is actually rendered as if the ground is snow-covered. This map would be useful for a variety of partisan, Battle of the Bulge, or East Front scenarios. The fifth map is mostly relatively open ground bisected by a hill; it evokes terrain in Tunisia, Sicily, or Italy. The sixth map is the most unusual (and attractive); it represents a jungle and palm-tree strewn area, complete with a beach and docks. It is perfect for all sorts of island fighting situations. To date, neither HOB nor any other third party publishers have used these maps outside of FF1. This is unfortunate, because they are useful for a variety of other circumstances. The scenarios themselves are not as successful as the maps. To begin with, they all use the “crew-served SW” grudge rules that debuted in Neither Fear Nor Hope. These rules, which penalize players for not using crews to man MMG, HMG, and MTRs, are in these scenarios not because there is anything particular to these scenarios which require such a rule, but rather simply because Steven Swann (& Co.) are unhappy with the official rules on this subject. The rules have not been very popular. Moreover, all the scenarios have simultaneous setup rules, where players set up at the same time with a board between them so they cannot see how the other player is setting up. The rationale for simultaneous setup was because the designers thought the scenarios were too small to allow the attacking player to know, prior to setting up, what the defender setup looked like; this would give the attacker an advantage. However, this sort of simultaneous setup actually penalizes the defender by making him unable to see half the map, and thus adequately defend against likely attacker approach paths. Additionally, it greatly favors someone who has played the scenario before. Lastly, all the scenarios feature “variable reinforcements.” In each scenario, both players make a pre-game DR to determine the composition of a small reinforcement group. Unfortunately, there is sometimes a wide range between the quality of the different results. In one of the scenarios, one DR may net the U.S. player 2 Sherman tanks, while another may bring it only a squad, a crew, and a MMG. Because these scenarios are all extremely small to begin with (a typical scenario might pit 5 squads against 4 squads with a vehicle or two thrown in, not counting the reinforcements), the result is that all the scenarios in FF1 are extremely dicey. It is really hard to balance adequately such small scenarios, even without variable reinforcements thrown into the mix, and unfortunately, the scenarios in FF1 have balance problems. A decade after their release, the ROAR play results of four of the scenarios give strong indications of being quite unbalanced. One scenario, FF4 (Walk in the Woods) may be balanced, while one scenario, FF6 (Night Ferry), just hasn’t had enough playings. The use of a variety of small non-geomorphic maps in a scenario pack is an excellent and innovative idea (although 11″ x 17″ maps might be better). However, some of the other ideas included in FF1, including very small scenarios, variable reinforcements, simultaneous setup, and crew served SW, may not be equally good. It would be great if in future releases HOB could keep the small map concept, but not be locked into such a rigid scenario structure format. There is no reason why all the scenarios have to be the same size, have variable reinforcements, and so forth. This scenario pack is only for completists.